After our amazing sunset superpod the other night all the whales headed north yesterday, then made their way back south towards San Juan Island in two separate groups today. 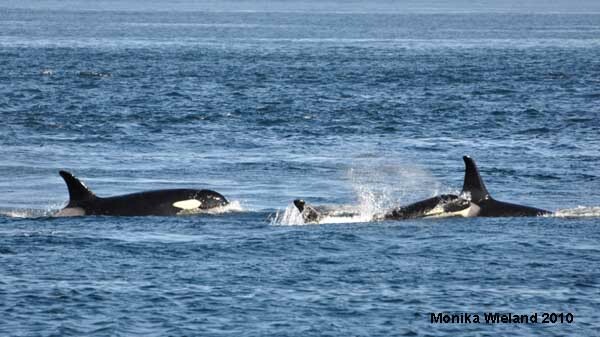 The first group, which included J-Pod, came down the west side of San Juan Island then headed offshore and spent the afternoon foraging quite a few miles offshore. This is pretty typical behavior. The other group, however, did something completely different. When they reached San Juan Channel and started heading south I headed to Cattle Point at the southern end of San Juan Island to see them, and I was very interested to see who would be in this group. 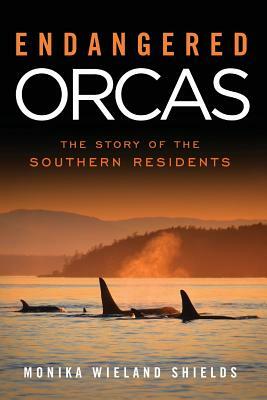 It's always fun to see the whales in Cattle Pass - something that only happens about two or three times a summer! K- and L-Pod whales pass just offshore of the Cattle Point Lighthouse. While I didn't identify every single member in all of these family groups, in my photos I documented whales from the following matrilines: K12s, K13s, and K14s in K-Pod; L26s, L7s, L72s, L4s, L47s, and L5s in L-Pod. 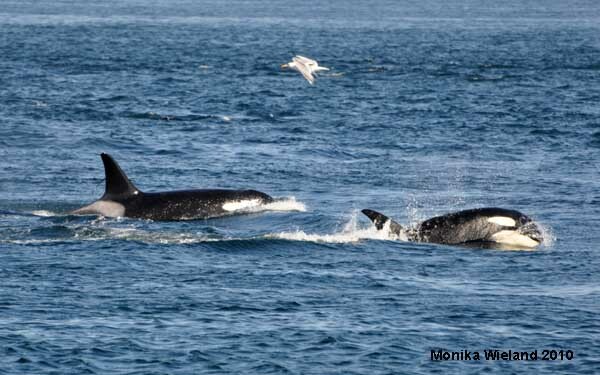 A couple of interesting notes: L7 Canuck and L53 Lulu, the whales that often travel with J-Pod and were with J-Pod just a few days ago, were back with L-Pod today. 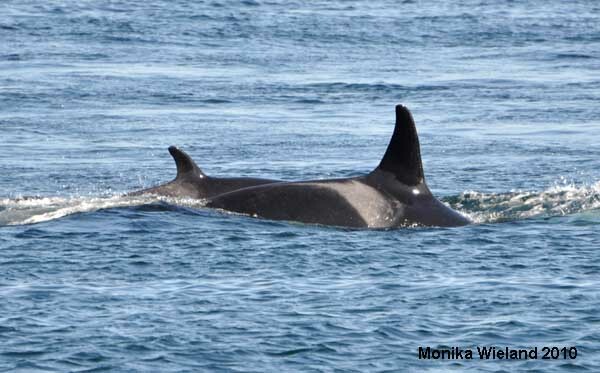 Also, the four K-Pod whales (K16, K35, K21, and K40) that also often travel with J-Pod did NOT seem to be present. 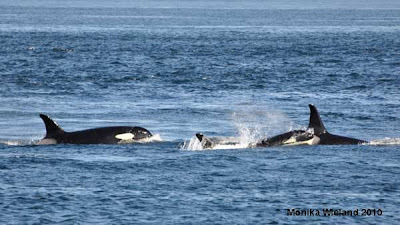 K12 Sequim and her young calf K43. K26 Lobo with a couple of Heermann's gulls and a glaucous-winged gull overhead. One of the interesting combinations was the mixed up group containing the K13s and some of the L4s. 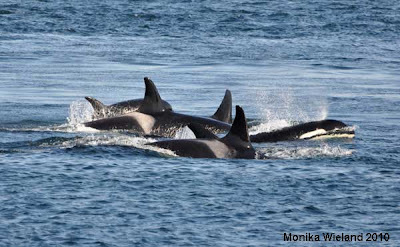 From left to right: K27 Deadhead, K13 Skagit, and L82 Kasatka. The whales were quite active as they made their way down San Juan Channel, and as I saw them approaching I saw breaches, tail lobs, and cartwheels. Once they reached Cattle Pass and its strong currents some of them were porpoising or lunging high out of the water, like L103 Lapis on the right below. The other whale is L91 Muncher - another interesting combination! 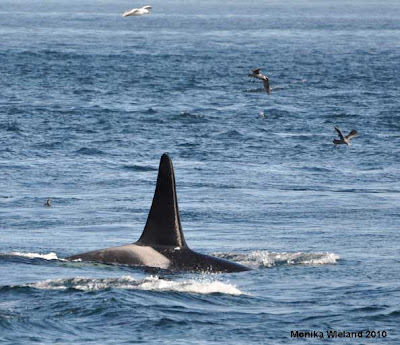 As the whales headed out of the Pass they angled offshore and north, presumably heading out to meet up with the other Southern Residents that were still out there somewhere. All in all it was another great encounter with the whales - puzzling, because of their different and unexpected behavior, and uplifting to me personally, as I was the only person on the shoreline (in the busy month of August no less!) as a big group of whales passed about 150 yards offshore of me. Are each group classification mean they are of the same male and female? Why do they sometimes travel together; mixed together?